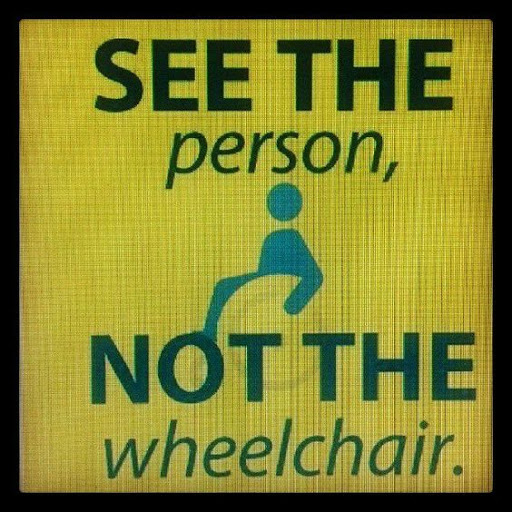 "See the person, not the chair"
A friend of mine from university shared this blog post by Sarah Wilson, 20 Things Not to Say or do to Someone in a Wheelchair. Since reading the article and sharing it on my FaceBook page, I pretty much for got about it until yesterday when I rediscovered this gem. It wasn’t until I read the article that these things came out of the shadows screaming their inappropriateness. A lot of these such as the “coming down to my level” and “patting me on the head” occurred to me personally. People, this is the cardinal rule. Remember that. This entry was posted in things not to say or do, wheelchairs by Aidan. Bookmark the permalink.